Happy Sabbath! I hope you are enjoying your day. It is my turn to share over on the Pazzles Craft Room Blog today. For those that don’t know, I love, love, love my Pazzles Inspiration. 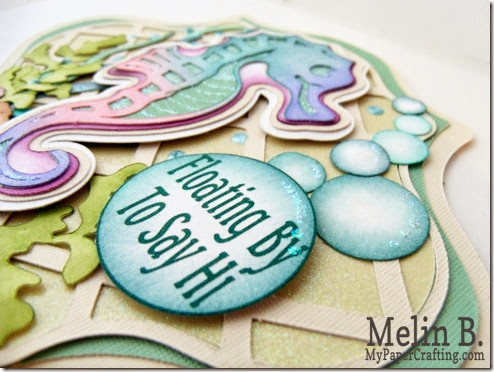 Today I am sharing a cute card I created with some of the latest Spellbinders digital die collections. Spellbinders and Pazzles have teamed up to bring you some of the fabulous Spellbinders dies in digital format. This means you can now have access to some of the Spellbinders collection for your cutting machines! Here’s my finished card. I used the Labels 13 S4-248 set to create my card base. I simply created a duplicate of the largest layer and welded them together at the top. I then cut one of the smaller layers using some of the very pretty paper in the DCWV Linen Closet cardstock stack. I then proceeded to cut out another smaller layer and then used that same sized layer and my lattice tool to create a latticed layer. I glued that on top of the bottom layer that was cut with some pretty glitter paper from the same stack. 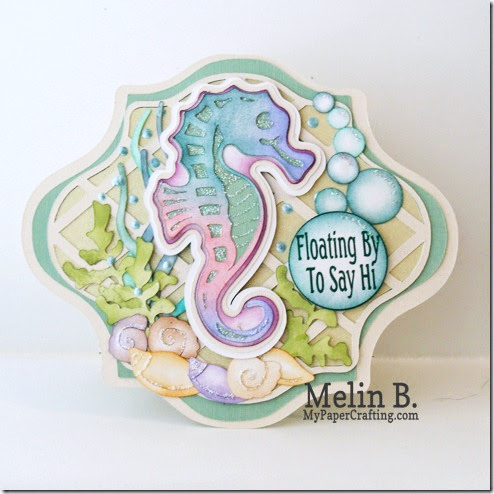 Next, I moved on to the pretty Sea horse from the From the Sea collection. I cut out several layers using a combination of papers from the same DCWV stack and also some plain white cardstock. With the plain white cardstock layer, I proceeded to ink the horse in varying shades of blues, purples and pinks. I then layered that on top of the other layers and then added some star dust stickles to dress it up. 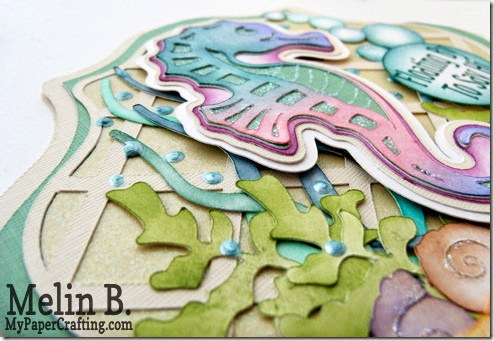 I then used the Ocean corner cut file and cut out the seaweed and the sea shells all in white cardstock. Once again I used my various colored inks to color the various pieces. I love the look of inking them when they are a white base. 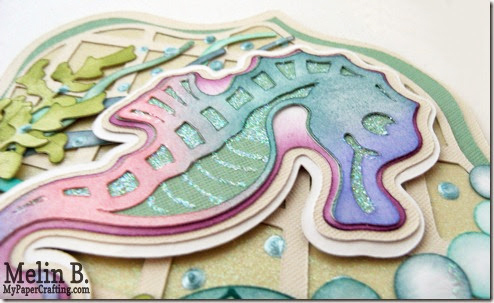 It gives the die cuts a softer, watercolor type look and you get more "depth" to the look of your die cuts. I added some blue liquid pearls around the seaweed and horse to simulate smaller water bubbles. I dressed up my shells with just a touch more of the Star dust stickles. Because it is iridescent, it takes on the color of each shell. Finally I created the sentiment in my software by simply using a font and typing it into a circle. I printed and cut that out and inked the edges. I then cut several smaller circles and inked them to simulate bubbles. Lastly, I just love that we have access to the Spellbinders collection with our Pazzles. Truly a match made in crafty heaven! Don't forget to pop over and check out the Pazzles Craft Room. They have some wonderful projects by the rest of the design team, great crafty inspiration and even some freebies too! Beautiful card! Love all of the layers and dimension; the colors are perfect, too! Great card, my friend! Melin, love it. The inking gives a lovely soft look to the card.